Nothing screams Halloween like the ghost and pumpkin tree. Use it as a decoration on your front door, at a ​Halloween party or let the tree pass out candy to trick-or-treaters for you. For a modified version of this project, decorate a large tree limb with the ghosts and pumpkins and then hang the limb over your door. 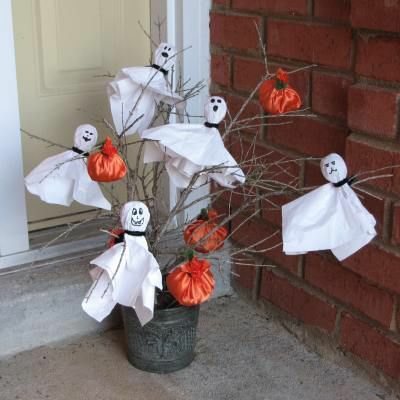 You can also make one or more of the trees in your yard a living ghost and pumpkin tree. There's no limit on how big or small your tree can be! This craft is easy to make and fun for the kids. It does require the use of scissors. Fingers could also come in contact with the sharp edges of the pipe cleaners. Adult supervision is required. Alternative: A large limb can be used in place of planting a dead bush or you can decorate a tree in your yard. Hide your lollipop within a white party napkin. Instant ghost! Now all you have to do is smooth one side of the napkin to eliminate crinkles. This will make it easier to create your ghost's face. Secure the napkin by wrapping one black pipe cleaner around the base of the lollipop. Make a few twists in the pipe cleaner. You will have excess pipe cleaner sticking out the back for now. You'll need this later when attaching your ghost to the tree. Here comes the fun part for the kids. With a black felt pen, give each ghost a face on the side of the napkin you smoothed in the previous step. Be creative! Give your ghosts character with unique, funny faces. Cut a 7-inch by 7-inch square of your orange fabric to make medium-sized pumpkins. Cover your hand with the fabric. The inside of the fabric should be facing up. Ball your candy into a round shape. Put the candy in the center of the fabric, which will become your candy-filled pumpkin. Gather the fabric at the top. Tie off your pumpkin with a green pipe cleaner. You will have extra pipe cleaner hanging off. Leave it for now. Create as many ghosts and pumpkins as you need for your occasion. If you're using your tree as a decoration only, 5 to 10 of both ghosts and pumpkins are usually enough for a small- to medium-sized tree. If you plan to let trick-or-treaters or party-goers take the candy, aim for 30 to 40 ghosts and pumpkins minimum. Pot your tree and prepare to decorate. At the base of your ghost or pumpkin, take the two ends of the pipe cleaner and twist to attach the pipe cleaner to the limb. Twist it a few times to lock it in place, being careful not to break the limb. Now that your ghost or pumpkin is attached to the limb, you can cut the extra pipe cleaner. Trim it close and tuck the sharp end of the pipe cleaner under so kids don't poke their fingers. Put your ghost and pumpkin tree by the door, on the table or take it to your kids' Halloween party at school. If your candies are wrapped, you can pack the tree away at the end of Halloween so it's ready to go next year.